"Several years ago, my partner and I went to San Juan, Puerto Rico on vacation and fell in love with it. The following summer, we bought an apartment in the Santurce neighborhood of San Juan, and if all goes well, we’ll be moving there to live permanently in three years. One day at the Museo de Arte de Puerto Rico, I found a petroglyph of the Taíno sun deity. (The Taínos were the indigenous people of Puerto Rico and other Caribbean islands who were thriving before Columbus’ arrival.) As soon as I saw the petroglyph, I knew I wanted it as a tattoo, and before leaving the island, I went to Harisumi Tattoo Parlor & Body Piercing on Avenida Ashford and had it done. Although I was a little concerned about being accused of appropriating Puerto Rican/Taíno culture, which, I have to admit, I did, I’m constantly stopped on the street or the beach by Puerto Ricans who tell me how wonderful the tattoo is." multiply. Then he passes out undone. 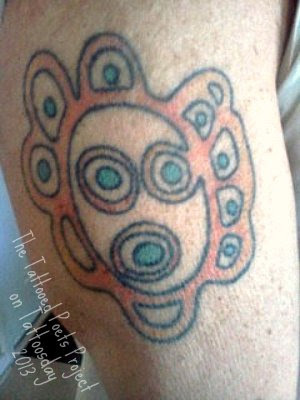 Jim Elledge’s H, a collection of prose poems, was issued by Lethe Press in 2012, and his A History of My Tattoo: A Poem won the Lambda Literary Award in 2006. His poems have appeared in many journals, including Barrow Street, Chicago Review, Denver Quarterly, Hayden’s Ferry Review, Hotel Amerika, Indiana Review, North American Review, Paris Review. His Henry Darger, Throw-Away Boy: The Tragic Life of an Outsider Artist is forthcoming in July 2013 from Overlook Press. Thanks to Jim for sharing his tattoo and poem with us here on Tattoosday!